such as floral or geometric patterns, icons and logos, in order to promote trust in the brand and convey quality. Watch the new animation presenting TRESU flexo printing of sanitary products here. 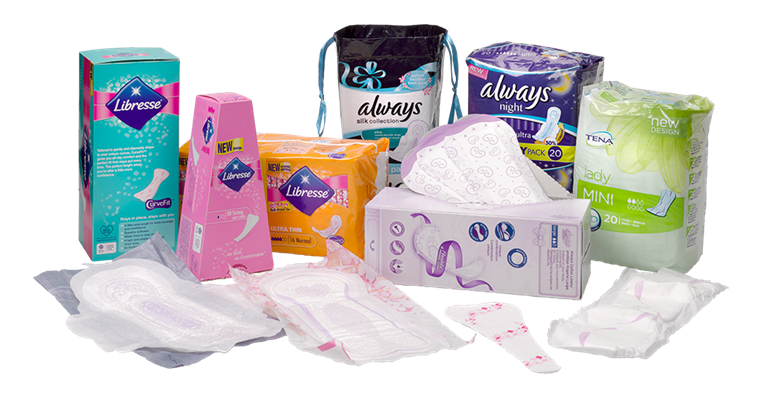 Femcare products with printed graphics are not new – however, until quite recently, achieving this came with significant challenges. Manufacturers have typically depended on an external supplier, ordering relatively large quantities of preprinted material, and converting it into finished products when needed. This, however, results in significant logistics and storage costs, lengthy leadtimes and high material waste levels. Furthermore, the manufacturer lacks the flexibility to change printed designs without scrapping the remaining stored material. Some manufacturers are seeking to integrate the printing process into the production line, with a flexographic printing unit between the converting and unwinding operations. This single-pass solution not only reduces waste and shortens leadtimes, but allows manufacturers to change printed designs with greater flexibility, reducing setup times and avoiding inconsistencies in production. The new flexo units, using water-based, solvent or UV inks and featuring between one and four colours, can be both specified on new manufacturing lines, and retrofitted into exiting lines. They can be customised in four different ways, according to space and layout constraints. Moreover, with servo drives, a high degree of automation and efficient drying systems included, the unit can integrate smoothly, performing without requiring operator intervention and setup times. The units are designed to handle nonwoven fabric or plastic material between 80 and 320mm width and 12 and 35gsm. They feature controlled web tension, to between 4 and 8N. The key elements of the flexo unit include a supply system with chamber doctor blade for feeding the ink, in an enclosed environment, to an anilox roll. The microscopic cells of the anilox deliver the exact amount of ink required to the printing sleeve, which finally applies the print pattern to the nonwoven fabric. A crucial concern is to include the printing units without disrupting the logistics and operator performance around the manufacturing line. Space availability – in terms of area or height – is likely to be scarce. As a result, the unit, based on a common impression formation, is contained in a compact housing, approximately 2m depth and 3m length. As a manufacturer of flexo units, drying systems and auxillary equipment, TRESU has developed four ways of integrating the printing process with existing converting machines, based on many years’ retrofitting experience in the manufacturing sector. First, a direct inline printing unit can be integrated into the manufacturing line after the unwinder. The length of the line is simply extended by moving the first segment of the line. If it is not possible to expand the length of the production line, the printing unit may be located beside the line, connected at a distance of approximately 4m. To optimise process flow, the unwinder and printing unit are positioned together. In a 90° configuration, the printing unit, together with the unwinder are situated at a right angle to the converting line, with the web running towards the converting line. After printing, the web passes over a bridge with a 3m drying unit, before descending to the converting line with the aid of a turn bar. Alternatively, the unwinder and printing unit may configured so the web runs parallel to the converting line. Finally, the printing unit may be integrated directly into the main frame and guarding of the converting machine. An ink supply system with automatic cleaning, as well as chamber doctor blades, ensures that ink is constantly fed the printing units at optimum viscosity, temperature and pressure levels. The sealed, pressure-controlled chambered doctor blade systems enable direct, foam-free transfer of ink or coating to the anilox rollers, ensuring a consistently clean printed image. This also prevents leakage, minimising cleaning times and emissions. The chamber’s eccentric clamping system allows safe, single--minute blade exchange. Additionally, the ink supply system performs fast ink changes with minimal loss of ink. During an change cycle, which takes no more than 15 minutes, the remaining ink in the chamber is returned to the pump. The chamber and anilox roll are thoroughly cleaned to remove residue, and the new colour is introduced, automatically. A control system stores and, in the case of repeat jobs, instantly recalls job recipes, so no re-entry of ink and calibration data is needed. At the installation stage, the TRESU technical team works with the customer to build a unique database of recipe settings for each job, including, among others, impression settings, print levels, flow rate, air velocity, temperature and register coordinates. The unit comes with an intuitive human-machine interface that is easy for operators to learn to use. Information from the HMI can also be viewed at the interface of the converting line’s main control panel. The printing unit comes with an integrated, high-performance air drying system, which is designed to minimise the risk of material elongation. An internal bypass function secures the controlled air flow in the system during machine stoppages or slow production mode. However, moisture extraction arguably presents a greater challenge, not only because of the web speed, but also to secure dried material before entering the converting process. A controlled process with adequate ventilation is therefore essential. TRESU’s drying solution comprises electrical air drying systems, situated both between printing stations and after the printing unit, to ensure all water is extracted from the material. Efficiency is optimised by using a relatively high air velocity, avoiding the need to use excessive heat which can result in loosening of fibres. It requires a relatively low drying temperature, thus avoiding the risk of tension loss due to loosening fibres and reduces energy requirements. The drying unit includes sensors for monitoring andautomatic control of temperature and humidity in the ventilation system to maintain optimum drying conditions at all times. Drying speeds and energy efficiency are optimised by situating the fan that applies the air and pressure inside the drying hood, shortening the distance from the fan to the air nozzle. This enables heat to be contained within the head and provides better insulation. A converting line with integrated flexo printing capability means the personal hygiene products manufacturer can meet the demand for branded goods, while having the flexibility to competitively offer shorter production runs, with sorter lead-times, with costs firmly controlled. It even gives manufacturers the option to refresh product lines with more frequent design changes, in response to trends in seasonal or demographic demand. With the assistance and guidance of a flexographic printing technology provider that has expertise in both the customised unit and the vital ink supply and drying elements of the process, the manufacturer is well placed to gain a long-term return on investment, from a smooth, productive workflow that requires a minimum of extra maintenance.